I made an answer on the Scifi.SE that can be read here. It is about how the characters in the story Jurassic Park might have gotten DNA for all the species shown. Apes and Humans, for example, share over 99% of their genes. That means the difference between our species is less than 1% of our genes. In fact, all life on Earth shares about 50% of it's genes. but in the original posting (before someone edited it) I chose to use the word DNA instead of genes. Sorry, I'm a biologist, I can't help it. Humans and apes share 99% similarity in the coding sequences of their DNA, the ~5% that codes for genes, not on all the DNA. I simplified this to genes for the answer. I have a basic high school understanding of DNA and genes, so I'm afraid I fail to see the difference between using "DNA" or using "genes" in my statement. I understand that genes are specific sequences of DNA that are used by the cell in some way. I understand that DNA is more generic, including all of the strands, whether they are used or not, whether they seem to code for something or not. So is it wrong then to say that apes and humans share 99% of their DNA or is it equally correct to say "genes"? So, a quick biology lesson, going backwards. Proteins are the things that make up a good percentage of our cells (which make up a good percentage of us), and are the things that do the work of the cells - many are also known as "enzymes". Proteins are encoded by genes - while the saying that one gene codes for one protein is now known to be pretty inaccurate (one gene can code for many different variations of the same basic protein), it's a good way to think about things in this context. Genes are made up of DNA, the "genetic code" that we hear about - the 4 billion (-ish) "letters" that make us who we are. However, now we get to the key part - all genes are made of DNA, but not all DNA is in a gene. In fact, as terdon mentioned in your comment, only about 5% (or less) of those 4 billion letters are in the expressed region of genes - those sequences that directly code for protein. The rest is regulatory, structural, and ... we're not exactly sure. Some call it "junk DNA", but it's stuck around for millions of years, so it must have some purpose, we just haven't figured it out yet. There are a lot of divergent sequences in this "non-coding" DNA between species, so it must somehow contribute to the differences between us, but how exactly that happens hasn't been elucidated yet. Here are the links to a paper about the function of "junk" DNA. It is as of 2013 very cutting edge. Since it was my edit of your question that started all this, I may as well weigh in. I will give a simplified version of genes and gene transcription, there are various details that make the process much more complicated than what I will describe but they are not relevant to the basic question here. 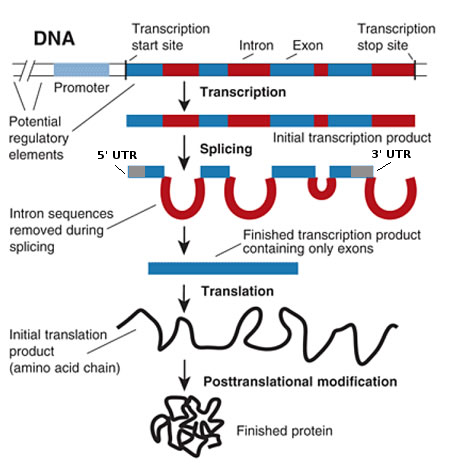 The take home message from the image above is that the red bits (the introns) are removed and do not affect the final protein product. So, only part of the gene codes for the protein. Introns tend to be far less conserved between different species than exons. Not only does the entire gene not code for protein but most of the genome does not contain genes. In fact, in humans, genes represent ~5% of the total DNA and exons represent ~2%. Another confounding factor are the sequences called repetitive elements. These are various types of usually shortish sequences that exist in many copies in genomes, In the human genome ~41% consists of repetitive elements of various types, and ~10% represents copies of a single such element (Alu), that's twice as many as genes. Such repetitive elements are usually not considered when calculating whole genome similarity rates. In terms of their entire genome, human and chimp are very very similar. However, the exact percentages vary (I've seen estimates from ~85 to ~90something) depending on the way the sequences are studied. To be on the safe side, you should say that they share 99% similarity at the gene level and leave it at that. Just to clarify definitions, your genome is made up of sequences of DNA. DNA is constructed pairs of four nucleic acids, or nucleotides (A,G,T,C). That DNA has many loci within it, each codes for a gene. Loci are given gene names such as SHH (sonic hedgehog) which is part of a discipline called gene nomenclature. Humans have two versions of each gene, one from each parent. These genes, such as SHH, have different variants called alleles. This is where you may have heard the terms homozygote and heterozygote, when a person has two copies of the same allele or two different ones respectively. You may remember talking about sickle cell anemia in high school. a single base mutation in the APOE (apolipoprotein E) gene is associated with a higher risk for Alzheimer disease. Here is a little reading on the humans vs chimp. You may also wish to see this similar post on biology SE. But the editor of your original post is right... only the Euchromatic region has been sequenced. "Humans and apes share 99% similarity in the coding sequences of their DNA"
The euchromatic region is often thought of as the protein coding part of the DNA, and makes up 92% of the genome (I think this is perhaps 92% of genes, but only a small part of the physical DNA). The rest, the heterochromatin, contains non-sequenced information and could harbour some of the DNA variation between the two species. Some work has suggested that the heterochromatin, previously labelled as Junk DNA, actually has some effect on traits. For example in Drosophila there has been studies which show effects of the Y chromosome on traits despite the Y chromosome being mainly heterochromatic. Further: I think a common source of confusion comes from the use of the word gene. It is often used interchangeably to mean either Allele or Genetic Locus. When someone says that humans and apes share 99% of their genes they mean they share 99% of their genetic loci. When someone says that a person shares 50% of their genes with a parent they mean that they share half of their alleles with that parent (it is only roughly half due to recombination and mutation). An individual has all (barring genetic defects such as deletions) the same loci as their parent. Most of the answers here focus on the difference between the concepts of 'DNA' and 'genes' very well. However, the sequence identity between humans and chimpanzees is not covered as rigorously and remains unclear from what has been answered. Therefore, I will elaborate on that, so that the first part of the question is also covered. Humans and chimpanzees differ approximately every 100 nucleotides in their total DNA sequence. 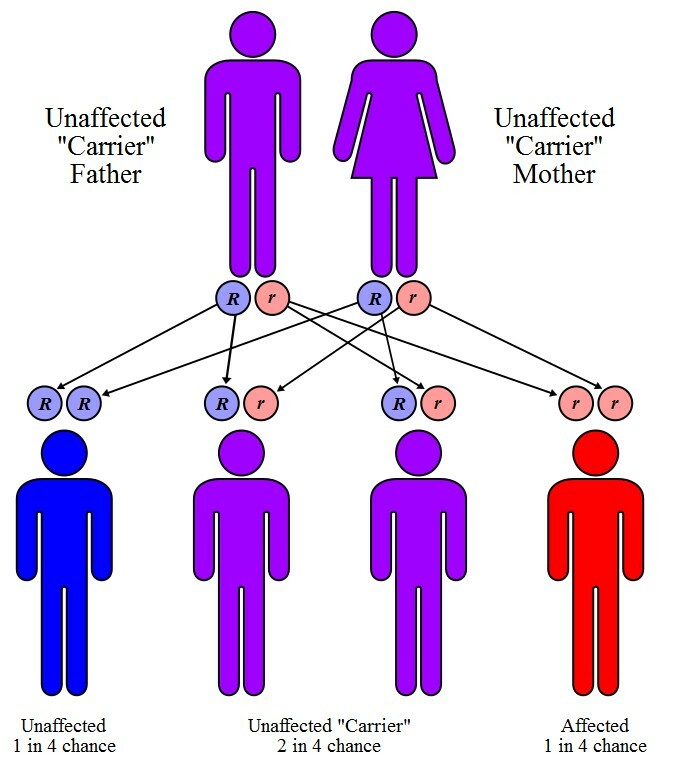 This is does not mean that 98.5% of the genes are shared. It means that humans have about 98.5% (more precisely about 98.8%, The Chimpanzee Sequencing and Analysis Consortium, 2005) sequence identity with chimpanzees, disregarding indels. They treated indels and nucleotide differences separately and "calculate[d] the genome-wide nucleotide divergence between human and chimpanzee to be 1.23%" which includes intergenic regions and introns - so obviously also non-genic regions. Sequence identity at the gene level is presumably way bigger. The Chimpanzee Sequencing and Analysis Consortium also gives information how this divergence is structured. The main part (about 85% of the 30 - 35 Mio. different nucleotides) comes from fixed differences: a fixed difference is a position in the haploid genome in which every human has, say, a G and every chimpanzee has a T. Accordingly, the site is different between the two species for every individual of the respective species. The smaller part (about 15%) comes from sites that are either variable (SNP) in humans or variable in chimpanzees, or in both (there is even a small number of very old variants, i.e. shared alleles between humans and chimpanzees, e.g. see Azevedo et al., 2015). Note that the estimates get better the more individuals of the respective species are sequenced and compared. Humans and chimpanzees differ approximately every 100 nucleotides in their total DNA sequence.This is does not mean that 98.5% of the genes are shared.It means that human have about 98.5% (more precisely about 98.8%,The Chimpanzee Sequence and Analysis Consortium,2005) sequence identity with chimpanzees,disregarding indels.They treated indels and nucleotide differences separately and "calculate[d] the genome-wide nucleotide divergence between human and chimpanzee to be 1.23%" which includes intergenic regions and introns-so obviously also non-genic regions.Sequence identity at the gene level is presumably way bigger. Not the answer you're looking for? 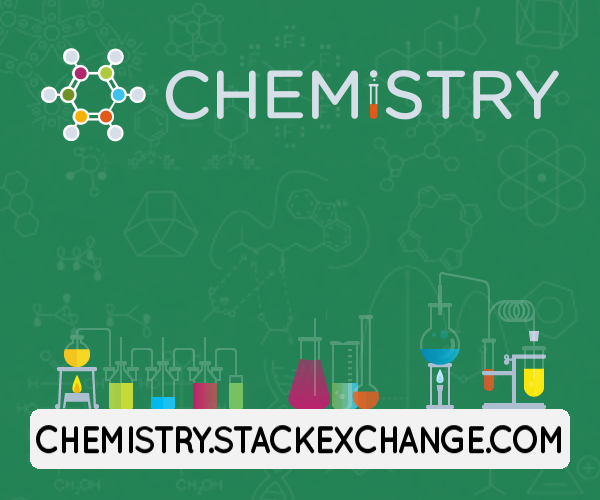 Browse other questions tagged dna genetics definitions or ask your own question.